I feel profoundly strange. Eternal Sky is, after all, the first series I have covered in its entirety for Nerds of a Feather. It is also, without any doubt, one of the most ambitious, creative and well-realized fantasy series I have ever read. So to think that my journey with Temur, Samarkar and Edene has come to its end leaves me with the ambiguous feelings of a fan who knows all things must come to an end (and appreciates that they should do so in timely fashion), yet wishes nonetheless that they might go on a little longer. Steles of the Sky is, like its predecessors Range of Ghosts and Shattered Pillars, exquisitely well-written. It is also marked by the same kind of careful world-building and characterization that have made George R. R. Martin a household name and genuine fantasy phenomenon. But despite a likeness in quality, Bear's series contrasts with Martin's in significant ways: it is more hopeful and less gritty (though it can be quite gritty in places); and it eschews medieval Europe in order to draw inspiration from Mongol, Arab, Tibetan and Chinese mythic and historical traditions. Like Paul Weimer, I see this as a very good thing. The world is much bigger and richer than epic fantasy's relentless focus on Western Europe would have us believe, and Bear's non-Western fantasy is about as sensitive and respectful as one would hope. In its best moments, Steles of the Sky (and Eternal Sky more broadly) is about cooperation, about adapting to new cultural environments and learning how to speak and work with those whose cultural reference points differ from our own. It's not that everyone in this world believes in a political concept of multiculturalism, but rather that they either find a way to work together or sink. This approach breathes life into what otherwise might appear a fairly cliched tale of "ragtag band of do-gooders fight evil god." All that said, Steles of the Sky may be the weakest of the three volumes in the series. It isn't bad by any stretch--actually it's quiet good, and when I say "weakest" I really mean "moderately less awesome than its predecessors." But there are a few nagging issues that, for me, keep the book from fulfilling the promise of Range of Ghosts. To begin, I've noticed throughout the series that its forward momentum comes when its characters are on the move, and particularly when they struggle to acclimate to new social environments. Leave them in a given place for too long, though, and the narrative loses steam. One of the best scenes in Steles of the Sky has Temur's grandfather Ato Tesefahun (alongside the deposed Uthman Caliph), seeking mercenaries in the walled city of Kyiv. It is rich, vivid and thoroughly captivating. Unfortunately, such scenes are fewer and farther between in Steles of the Sky than in earlier installments, while there are rather more where everyone stands around being polite to each other. I also noticed some unevenness in the character narratives. Samarkar's and Edene's are good, as usual, as are those of the "relatable villain" Saadet (al-Sepehr's daughter). And the shorter perspective chapters for Tesefahun and Brother Hsiung are also quality. Temur's, however, are only sparsely populated across the text, as if Bear is trying a bit too hard to decenter the narrative from its protagonist. I didn't particularly like that. Making matters worse, some of the space that might have gone to Temur instead goes to characters like the Dowager Empress Yangchen, who as far as I can tell doesn't actually add anything significant to the story. This is the same problem Martin encounters in A Feast for Crows and A Dance with Dragons--especially with the rather pointless Quentyn Martell narrative in the latter book. The problem is less pronounced in Steles of the Sky, to be sure, but similar nonetheless. Finally, you may recall how, in the review of Shattered Pillars, I expressed some discomfort with the portrayal of the Muslim-based culture, but expressed the hope that this would be addressed in the final book. My concerns were, at best, partially dealt with--in Saadet and the slave-poetess Ümmühan, Bear has given us two very interesting and three-dimensional characters from the Falzeen and Rahazeen sects--a number that can be expanded to four if you count Temur's alt-Ethiopian grandfather Tesefahun and mother Ashra. But notice that three of the four are women. With the exception of Tesefahun, the Falzeen and Rahazeen men are all arrogant, authoritarian and more than a little misogynistic. I guess you could argue that Uthman Caliph has some character growth as the book goes along, but it's marginal at best. Al-Sepehr, Kara Mehmed, Saadet's ghost twin Shahruz and Mehmed's lieutenant, meanwhile, are downright vile--and there aren't really any positive depictions to counter-balance these. This stands in stark contrast to Bear's portrayal of men from the other cultures, at least some of whom are sympathetic. I can't imagine Bear did this intentionally, and I'm inclined to give her the benefit of the doubt here--but I can't help wishing the result had been a bit different. 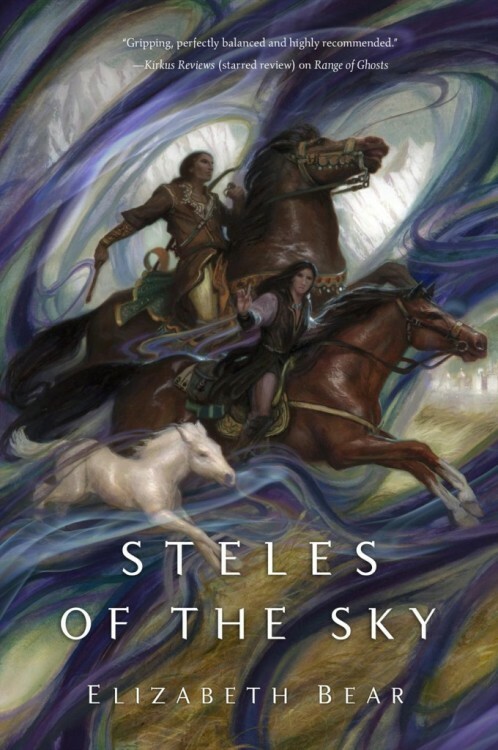 Though I've harped on a few issues in this review, let me categorically state that Steles of the Sky is, on balance, a satisfying conclusion to an excellent series. Through its exemplary prose and astonishing world-building, Eternal Sky raises the bar for fantasy writers, and redefines what can be attempted and accomplished within the genre. Penalties: -1 for narrative unevenness; -1 for (likely unintentional) othering of Falzeen/Rahazeen.